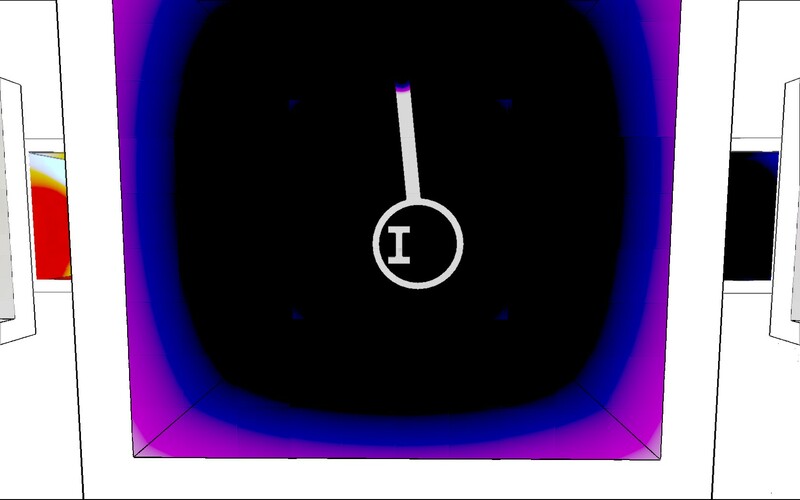 Antichamber: Where Non-Euclidean Space Is Just The Beginning. I’ve become a really big fan of titles that challenge our expectations and perceptions of what constitutes a game. Usually this comes down to mechanics, like how Half Life 2 introduced physics based puzzles (something that was essentially impossible previously) but there have been many titles that have up ended the traditional idea of how games should operate. Quite often this leads to novel experiences that you just won’t find in other games, although there have been some notable exceptions. 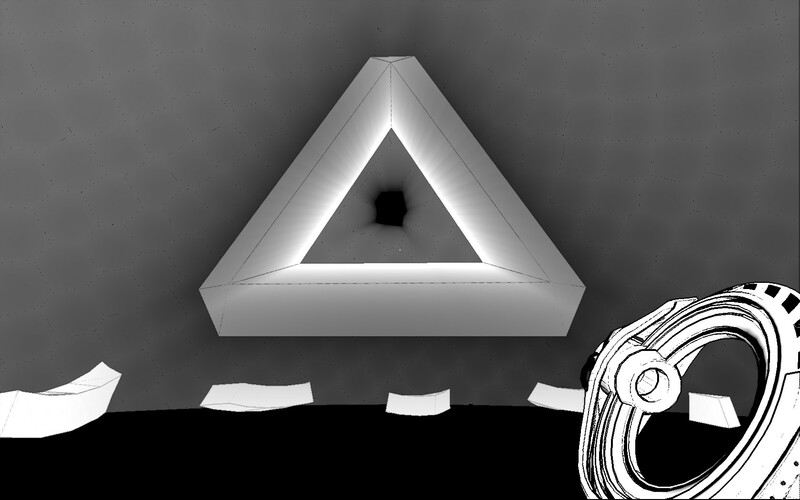 Antichamber is one such game that takes your preconceived notions of traditional game mechanics and continuously breaks them down in order to build them back up and does so in an incredibly intriguing way. 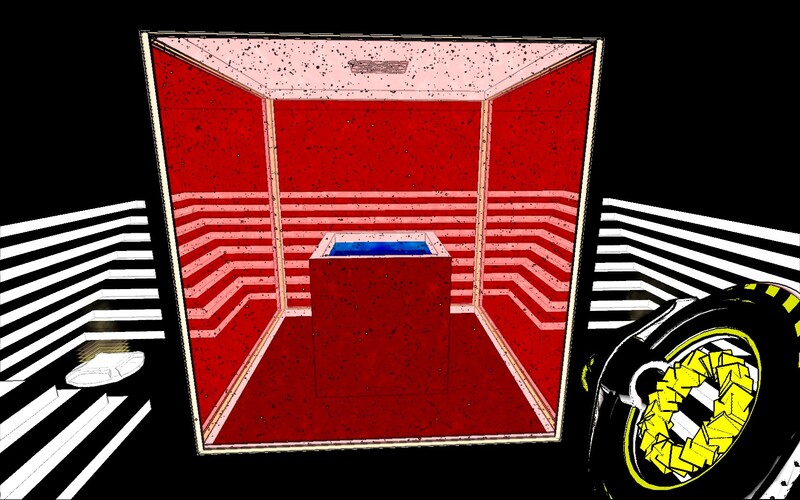 Antichamber throws you into a dark room with 3 walls that look like chalkboards and one that’s a window, with the apparent exit sitting behind it, tantalizingly out of reach. You’ll then turn your eyes to what looks like the beginnings of a map whereby a single click will transport you into a room. Things seem somewhat normal at first but it doesn’t take long before you’re seemingly trapped in a world that’s constantly changing the rules on you, forcing you to break all the conceptions you have about how things should behave and reforming them to fit into this strange new world. The world of Antichamber is one of stark contrasts with the primary colour being white which is then offset by heavily saturated colours, all blended together in cel-shading to give everything this slightly surreal cartoonish feel to it. The visual style reminds me of The Unfinished Swan which similarly used white as the primary colour and it works just as well when its transported from that whimsical world to the cold, unforgiving world that is Antichamber. This combined with the decidedly organic sounds that proliferate the environment make for an unique experience that’s hard to put into words accurately but it certainly does work well. Now this is the point in the review when I go over the core game mechanics which, for most games, typically consists of a few well known ideas with an unique twist. 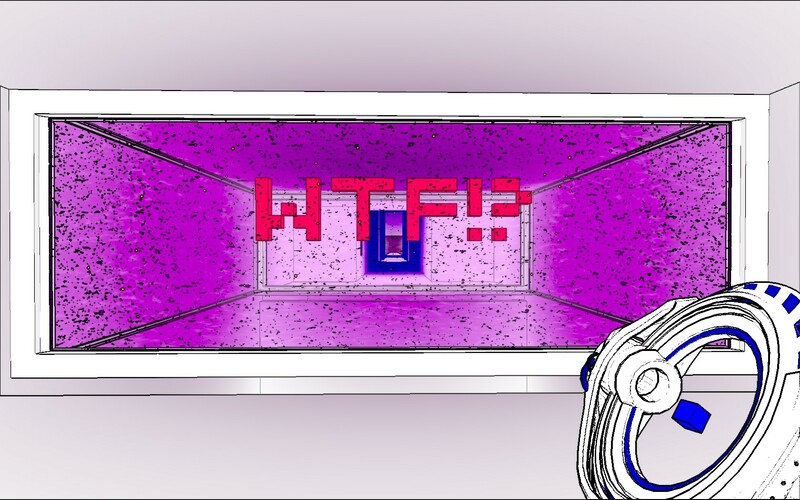 Whilst there are some familiar mechanics in Antichamber they are really only a distraction when compared to the variety of ways in which the game world behaves differently to that of any other game. Looking at a wall from one side could should you one thing while looking at it from another could show you something entirely different. You could walk down the same path dozens of times, seemingly going around in circles, only to find that if you turn around the correct path suddenly appears before you. Just when you think you’ve figured them all though you’ll likely be surprised by yet another strange twist on how this reality operates, forcing you to rethink not only the current puzzle but all of the ones that you encountered previously. The non-euclidean geometry is only the beginning as well. Part way through you’ll be given a gun, for want of a better term, that’s capable of removing, storing and then placing blocks ala Minecraft style. Initially the use of blocks is relatively limited, usually used in order to trigger switches, hold doors open or as ledge for you to jump on. 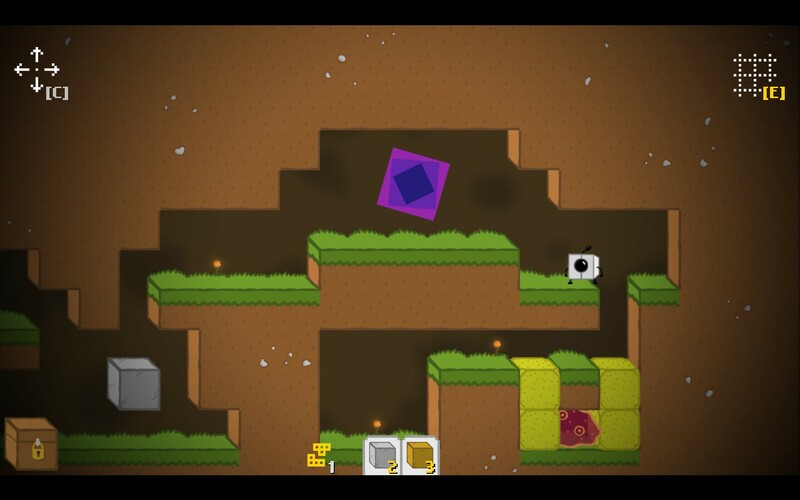 However as you go through the various levels you’ll be able to find upgrades to it that will allow you to draw blocks in a line, required for some puzzles where you can’t place blocks directly, and another which allows you to tell blocks to move to a certain point. The mechanics sound simple on their own but their use is really anything but leading to a whole bunch of highly frustrating yet satisfying puzzles. The use of all these tools as well as the non-euclidean nature of most the puzzles is actually fairly intuitive for the most part which most puzzles having a pretty obvious solution should you be familiar with this particular style of game. This is primarily due to the not-so-secret hints that are contained within every little pictograph that’s lying around before/after each puzzle which gives you a bit of indication of how to go about solving it. Without any tutorial to speak of however there are some mechanics that aren’t really explained at all which can lead to you getting stuck with no way of progressing until you haphazardly figure it out or look it up online. The prime example of this for me was the ability to generate an unlimited number of blocks if you drew a hollow square on a wall. Upon completing said square it will fill itself in, generating a large number of blocks for you to use which can then be used to generate even more, ad infinitum. The “Too Many Lasers” puzzle is a prime example of a puzzle that you will simply not be able to solve unless you’re aware of this mechanic and a quick Googling around reveals that most people discovered this mechanic by mistake, not by intuition from the game. It’s probably the biggest criticism that I’ll level at Antichamber as whilst I can understand the idea of making discovery part of the game you at least need to include a decent way of discovering the core mechanics, especially when its as vital as the one I mentioned. There’s also an incredible amount of emergent game play possible once you’ve got the fully upgraded manipulator gun and a decent supply of blocks stored up. Whilst I’m sure this has been taken into consideration during Antichamber’s design there were a couple puzzles which I put in the too hard basket early on only to come back later and breeze through thanks to my stash of blocks. Not all of them can be done like this due to the use of the block destroying gates but there are quite a few that you can break severely should you manage to bring your blocks along. For a game with potential for so many game breaking bugs I’m happy to report that my experience with Antichamber was mostly trouble free with the exception of trying to get it to run at the start. There’s a rather unfortunate bug in earlier versions of the PhysX engine which conflicts with the UDK which causes Antichamber to die before you can even get into it. Thankfully checking the discussion forums on Steam led to me finding the required update and the game ran smoothly after then. This solution isn’t working for everyone at the moment so your mileage may vary. Antichamber is a truly mesmerizing and challenging game, filled with puzzles that will break down your preconceptions, rebuild them and then unceremoniously break them again just to keep it interesting. So many of the puzzles were incredibly cheeky in their implementation, teasing you openly for thinking that something should have worked which simply didn’t. It was one of those times where getting a puzzle wrong was actually one of the most enjoyable aspects as I know the coding behind this must have been an incredible challenge developer, something I really appreciate. 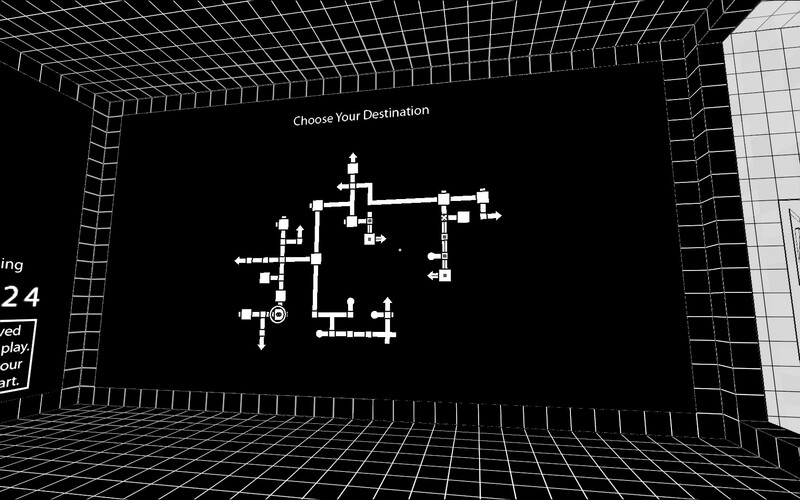 Antichamber is right up there with titles like Portal for its innovative game play and definitely makes my list of must play games for 2013. Antichamber is available on PC right now $19.99. Total game time was 4 hours. Blocks That Matter: They Really Do. They say that imitation is the most sincere form of flattery and if there’s any truth to that then Notch, creator of Minecraft, must be feeling awfully flattered. Whilst there’s only been a few outright copies that have looked to capitalize on Minecraft’s success there’s seemingly an endless number of games that have drawn inspiration from it. From games like Terraria which translated the idea into 2D and then added its own flavour to others which have taken the block/mining/building idea and put some kind of twist on it. 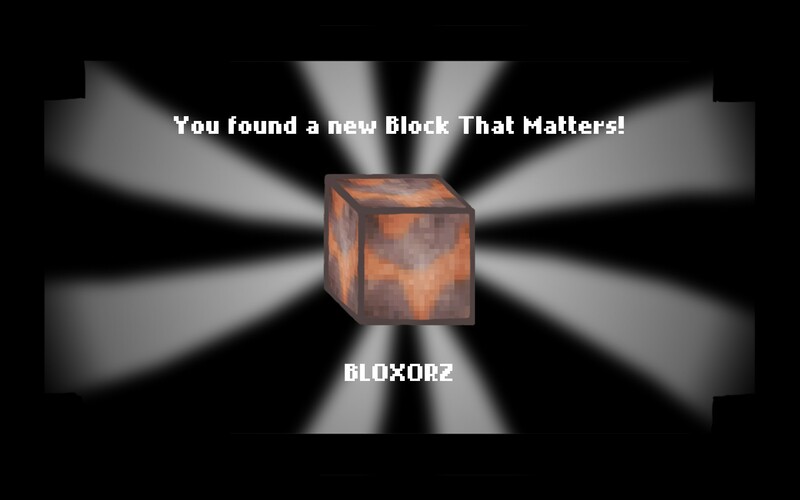 Blocks That Matter is the latter, being a 2D puzzler that uses the idea of mining and placing blocks as the main game play component. 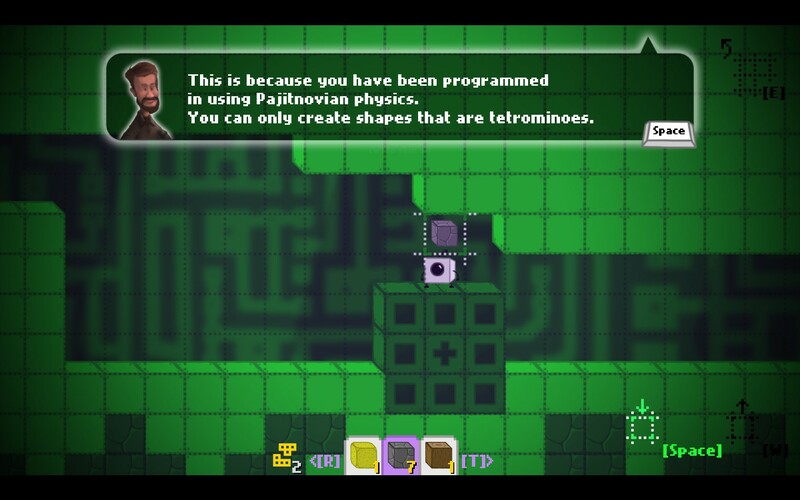 Blocks That Matter puts you in control Tetrobot, a small white block with arms, legs and a drill who’s capable of mining blocks and placing them anywhere on the map. You’re the creation of 2 struggling game developers who, instead of working on their latest title, were working on you. This drew the ire of a mysterious individual who kidnaps the developers and forces them to complete their game. You are their only hope for rescue and in order to make it to them you have to navigate your way through various puzzle areas in order to reach a portal that will transport you closer to them. Whilst there’s nothing particularly amazing about the graphics of Blocks That Matter I did find it quite visually pleasing, mostly because of the neo-retro aesthetic that’s consistent throughout the entire game. There’s a definite homage to the classic platformers with many of the tile sets bearing a striking resemblance to the games that inspired them. That being said whilst it might be inspired by several different games of yore Blocks That Matter still has its own distinct style about it and I certainly never found myself thinking I was bored with it visually. As I alluded to earlier Blocks That Matter draws inspiration from Minecraft for one of its main mechanics but it also combines aspects from another game to give it a challenging bent. Whilst you’re free to mine and collect certain types of blocks (a selection which gets expanded as you progress) you can’t simply place any block wherever you want. There are 2 simple rules to placing blocks: the first is that it must attach to another block or a wall somewhere, meaning you can’t just place them in the middle of the air. The second, and by far the most challenging aspect, is that all the blocks must be placed in sets of 4 meaning all the shapes you can create are in fact are tetrominoes (the pieces found in Tetris). In the beginning this doesn’t present too much of a challenge, especially once you figure out certain ways to construct things that will allow you to recover the majority of your blocks whilst getting one of them into the position you needed it in. There’s also some areas where Blocks That Matter shows off some emergent game play aspects because of this as if you manage to save enough blocks you can effectively get yourself anywhere on the map without too much trouble. This idea of block conservation becomes key in later levels as many of the puzzles will be incredibly difficult unless you have a certain number of blocks spare. This becomes even more important when you’re given the skill which can destroy any type of block (useful as there’s many block types that you will simply never be able to drill) as long as they’re in a row of eight or more. Quite often you will be able to make rows with a certain minimum number of blocks, however should you simply rush into it you’ll end up wasting blocks that you didn’t need to. Finding these little block advantages isn’t necessarily required if you’re just trying to get to the end however should you want to mine the block that matters (the little treasure chest shown in the bottom left hand corner in the screenshot above) every block counts as most of the time you’ll need all of them to get to it. For the most part the puzzles are challenging and rewarding upon completion, especially when you manage to get through them the first time through. However I feel there’s a critical flaw in the way most puzzles play out. 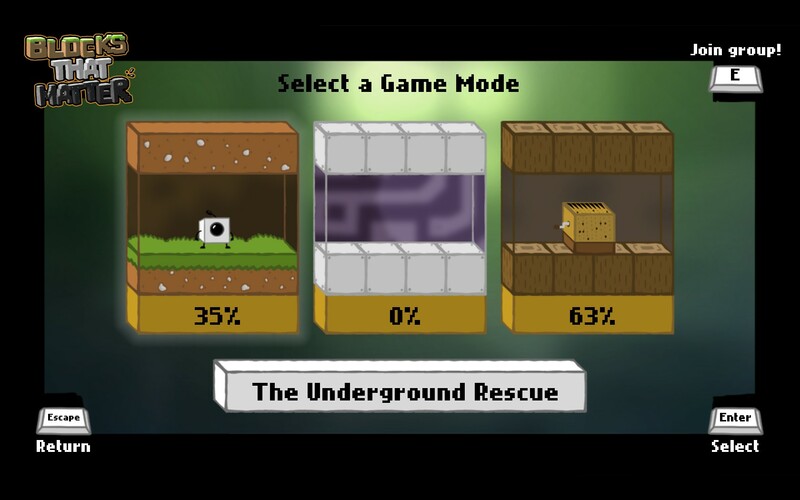 You see it’s quite possible for you to get yourself into a situation where you will not be able to complete a level (like being trapped under undrillable blocks). Don’t worry you can suicide yourself and restart the level, all good right? Well whilst that does get around the sticky problem of having to playtest everything so thoroughly that the players can never truly bugger themselves up it does mean that challenges you once completed get undone, forcing you to replay that section of the level. When you make a simple mistake right at the end of the level having to replay it all from the beginning isn’t that fun, especially if that “mistake” was misplacing a block which you could no longer recover. The puzzles also start to get a bit samey after a while, even with the additional upgrades that add different game mechanics. There’s just over 40 levels in the adventure mode and another dozen or so in the bonus section but by about the halfway point you will have seen most of the tricks. From there on it’s just a matter of making your way through them, conserving blocks and figuring out which types need to be saved and which can be turfed. Don’t get me wrong, I’m sure there’s a lot of people who will enjoy that kind of challenge, but it certainly lost me by about level 34 or so, to the point where I didn’t bother playing through until the end. The story is also a little strange as it takes the 4th wall, smashes it into pieces and then proceeds to dance on its bloody corpse for the rest of the game. The characters are Penny Arcade style spin offs of their creators being 2 independent game developers which mirrors Swing Swing Submarine’s actual development crew. It’s a rather light hearted affair and really only there to give you some modicum of motivation to keep doing what you’re doing but I couldn’t help but feel a little awkward during any of the plot points thanks to that 4th wall chicanery. For a game that’s essentially a mash up of nearly every game that my generation grew up on Blocks That Matter does a great job of creating its own unique experience using all those elements without feeling like a cheap imitation. The puzzles are challenging, artwork unique yet familiar and the overall experience is smooth and trouble free. The story and having to repeat challenges ad nauseum are where Blocks That Matter lets itself down and whilst there’s no easy way to fix the story the addition of a quick save system would go a long way to making those long, complicated puzzles towards the end much more enjoyable. For fans of puzzlers or just those of us who grew up on all the titles that Blocks That Matter pays homage to there’s a lot to love in this game and is worth paltry price of admission. 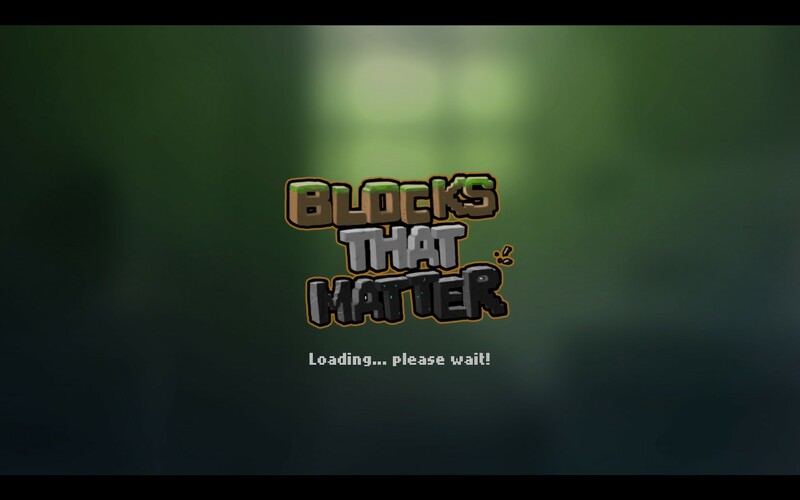 Blocks That Matter is available on PC and Xbox right now for $4.99 and 240 Microsoft Points respectively. Game was played entirely on the PC with around 4 hours played and 28% of the achievements unlocked. 4 hours played, 28% of the achievements unlocked. Sandbox games and I have a sordid history. Whilst I often enjoy them it’s not usually because of the engrossing story or intriguing game mechanics; more it’s after I’ve finished the mission at hand, saved my game and then promptly engage Jerk Mode and go on whatever kind of rampage the game allows me. Long time readers will remember this being the case in my Just Cause 2 review where I grew tried of having to do everything within the rules of the game and modded my way to Jerk nirvana. Still there have been some notable exceptions, like Red Dead Redemption, where the combination of certain elements came together in just the right way to get me completely draw in an engrossed in the story. Minecraft, whilst sharing the sandbox title, has almost no elements of a traditional game in this genre. Having more in common with game mods like Gary’s Mod Minecraft throws you into a world where the possibilities really are only limited by your imagination. Over the past few months I have watched the news around it go from a single story to a media storm and I was always fascinated by the way it managed to draw people into it. Up until a couple weeks ago however I hadn’t bothered to try it for myself, not even the free version. However after watching a few videos of some of the more rudimentary aspects of the game I decided to give it a go, and shelled out the requisite $20 for the full (beta) version. The premise of the game is extremely simple. You’re thrust into a world where everything is made of blocks and at night time hordes of zombies and other nefarious creatures will emerge from the wilderness, baying for your blood. The tools you have at your disposal are only your blocky hands but the world of blocks around you can be used to your advantage. By cutting down trees you can make wood which can then be converted into a whole range of tools. The race is then on to create some kind of shelter before nightfall comes, so that you might have a place to hide when the horde arrives. As you progress deeper however you’ll begin to discover other rare and wonderful materials that can make even better tools and weapons, leading you to delve even deeper underground in order to find those precious resources. However whilst the basic idea extends to only surviving through the night there’s the entire meta game of creating almost anything you can think of within the Minecraft world. The world’s resources are pretty much at your disposal and their block like nature means you can build almost anything out of them. This has lead to many people building extremely ornate structures within Minecraft, ranging from simple things like houses right up to the Starship Enterprise. As with any sandbox game I took the opportunity for absurdity as far as I could imagine it at the time building a 1 block wide tall spire high up into the clouds where I mounted my fortress of evil. All that’s missing is an Eye of Sauron. The basic game mechanic of Minecraft has a dinstinctly MMORPG feel to it. You start out by cutting down trees for wood so you can make a pick axe to mine cobblestone. You then use the cobblestone to make better tools in order to mine iron. You then use the iron to mine other resources like gold, diamond and redstone. Much like the gear grind that all MMORPGs take you through before you’re able to do the end content Minecraft gets you hooked in quickly with the first few resource levels passing quickly. Afterwards it’s a much longer slog to get the minerals you require to advance, usually requiring you to dig extremely deep to find them. Like any MMORPG though this mechanic is highly addictive, leading me to lose many hours searching for the next mineral vein so that I can craft that next item. After the first week however I started to grow tired of the endless mining that didn’t seem to be going anywhere. I had dug all the way down to bedrock and had found numerous rare resources but seemed to be lacking the one mineral I needed to harvest them: iron. Googling around for a while lead me to figure out that I was digging far too deep to find much iron and that the best place to find resources was in randomly generated dungeons or caves, basically pre-hollowed out sections of the map that were always teaming with resources (and zombies). After randomly digging for a while I started hearing the distinctive zombie groan and I followed it to the ultimate prize. Oh yeah, that’s the good stuff! Exploring this find lead me onto a string of caves all containing the resources I needed to progress further and I was hooked again. Whilst the last few hours I’ve spent with Minecraft have focused more on extending my fortress of evil and the surrounding area I still find myself often taking a trip down into the mines in the hope of coming across another cave or mineral vein as the excitement of finding one is on par with getting some epic loots in a MMORPG. I also set about setting up a Minecraft server so that I could play along with some of my more dedicated Minecraft friends although with a server fan dying I’ve had to put that on hold until I can ensure that it won’t overheat with more than one person playing on it. Would I recommend this game? Most definitely, especially if you’re the type that enjoys sandbox style games that allow almost unlimited creativity. I was the kind of person who lost hours in Gary’s Mod, making whacky contraptions and using them to unleash untold torment onto hordes of Half Life’s NPCs. The tables are very much turned in Minecraft’s world but it’s just as enjoyable and I have no doubt that anyone can lose a few good hours in it just exploring the retro world that Minecraft generates for you. The game is still technically in beta but for the price they’re asking it’s well worth the price of admission. Minecraft is available for PC and web browser right now for a free trial or AU$20. Game was played on a local single player instance for the majority of game time with an hour or so spent on a multiplayer server. No rating is being assigned to this game as it’s still in beta.